Standout Kristoff Kowalkowski is Among America’s Top Prep Football Athletes to Gather at Football University Top Gun Showcase in Dublin, Ohio. St. Cloud, MN (7/7/15) – Kristoff Kowalkowski of St. John’s Prep, from (St. Cloud, Mn) has been invited and will be competing at the nation’s top prep football all-star camp, Football University (FBU) Top Gun, at Dublin Jerome High School in Dublin, Ohio from Monday, July 20 to Wednesday, July 22. Being a part of FBU Top Gun means that these players are considered the best at their respective positions. Kristoff Kowalkowski, was invited to Top Gun because of his outstanding performance as a QB at the FBU Minneapolis camp. He will join more than 1,600 of the nation’s top athletes at their respective positions and will train with current and former NFL coaches and players. Top Gun is the culmination of Football University’s 24-camp nationwide camp season gathering the most elite performers from across the United States and allowing them to compete and display their abilities together on one stage. Football University has an impressive alumni list that includes some of the top college football recruits and players in the nation. Headlining the Top Gun Showcase coaching staff are quarterbacks coach Jeff Rutledge, former quarterback coach of the Arizona Cardinals; running back coach Robert Edwards, offensive line coach Jim McNally, who is considered the best offensive line coach in the game; defensive back coach Ray Buchanan; and wide receiver coach Charlie Collins, who is considered one of the finest receiver coaches in the game. The green miracle drink from China made its way long ago into the mugs of Americans all across the nation for its touted health benefits. From a weight loss aid to targeting pancreatic cancer, green tea has evolved into a medicinal drink that caters to a myriad of illnesses. The reality is there are surprising benefits to reap from this magical drink in just one cup. Green tea may need to be added to your allergy season arsenal. Drinking the green liquid may provide some relief, as it's been proven to be anti-allergenic; a specific compound, epigallocatechin gallate (EGCG), appears to be the most potent. A 2007 study published in the journal Cytotechnology found the tea polyphenol can reduce pollen allergies. This is the first time a methylated form of EGCG can block the IgE receptor — the key receptor involved in an allergic response. It can elicit a stronger anti-allergenic response than normal EGCG, which makes it the strongest anti-allergen compound found in tea. Quercetin, a naturally occurring flavonol in tea, can also alleviate a histamine response. Carrots have long been associated as a food that promotes good eyesight, but science suggest there’s a new kid on the block. The antioxidants found in green tea can actually penetrate the tissues of the eyes and produce antioxidant activity. Catechins, an antioxidant in green tea, are capable of being absorbed into the tissues of the eye. A 2001 study published in the journal Experimental Eye Research found green tea can actually prevent cataract-induced blindness. Researchers saw different parts of the eye absorbed varying amounts of catechins, with the highest concentration of this antioxidant found in the retina of lab rats fed green tea extract. The area with the least absorption of catechins was the cornea. These findings suggest that drinking green tea could serve as a protective measure when it comes to eyesight, but its effects have yet to be confirmed in humans. The access to greasy foods puts your health at risk for heart-related complications like high cholesterol. Replacing unhealthy snacks and drinks with green tea could actually help keep your cholesterol levels at bay. Green tea’s powerful antioxidant, EGCG, is believed to inhibit the absorption of cholesterol from the large intestine. A 2011 study published in The American Journal of Clinical Nutrition found green tea consumption significantly lowered the total serum cholesterol and LDL cholesterol across 14 randomized controlled trials of over 1100 participants. Overall, green tea intake led to significant reductions in total cholesterol — 7.2mg/dL, and mean low-density lipoprotein (LDL) cholesterol (2.19 mg/dL). Research suggests drinking five cups of green tea per day will provide the biggest reduction in cholesterol. Drinking tea has been given a bad reputation for its staining effect on your teeth. The hot beverage contains tannic acid, which is what gives tea its dark-like color. However, the consumption of green tea can actually be beneficial when it comes to your oral health. A 2009 study published in the Journal of Periodontology found the intake of green tea was inversely correlated with periodontal disease. Regularly drinking green tea reduced symptoms of periodontal disease, possibly due to the presence of catechin. Catechin reduces inflammation in the body, and therefore, interferes with the body’s inflammatory response to periodontal bacteria. Its ability to control bacteria and lower the acidity of saliva and dental plaque makes it useful for preventing cavities and other indicators of poor oral health. Green tea has been known to target pancreatic cancer, and most recently oral cancer. Its strongest antioxidant, EGCG, is able to help kill cancer cells through destruction of the cells’ mitochondria, and may even become a possible alternative to the debilitating chemotherapy. Green tea consumption is believed to not be associated with any of chemo’s side effects, according to a recent study published in the journal Molecular Nutrition & Food Research. “It looks like EGCG causes the formation of reactive oxygen species in cancer cells, which damages the mitochondria, and the mitochondria responds by making more reactive oxygen species,” Joshua Lambert, associate professor of food science at Penn State, in a press release. Eventually, the mitochondria loses its defenses with a breakdown in the expression of antioxidant genes. It is in this weakened state the cancer cells succumb to EGCG and die. You may want to add a packet of green tea in addition to sunscreen and sunglasses when you visit the beach. The catechins in green tea can actually make the skin more resistant to the effects of UV rays and therefore premature skin aging. They can also lead to reduced skin redness after UV exposure. A 2013 study published in the British Journal of Nutrition found a relatively low dose (540 mg) of green tea catechins each day along with 50 mg of vitamin C for 12 weeks, or two cups of green tea can considerably reduce the effect of UV radiation on the skin. When UV exposure produced inflammation, green tea supplementation reduced that effect. This is the first time oral doses of green tea has been proven to make their way to skin tissues to limit the effects of the sun’s ultraviolet rays. As scientists continue to study and learn more about its effects, we’re continuing to learn why sugar should be only a very small part of diets.Among other health issues, in excess, sugary foods and beverages like soda, candy and even snack bars and cereals contribute to weight gain and obesity, impaired memory, and an increased risk for heart disease and diabetes. First and foremost, Ficek does not recommend trying to “kill your addiction” through a cold turkey detox or any other similar method.“If you believe you eat too much sugar, why not try cutting back rather than abstaining 100 percent?,” Ficek said. “Forcing yourself to eliminate sugar completely for any length of time increases the likelihood of binging on it at some point.” For this reason, Ficek says, instead it’s important to find a balance in your diet and practice moderation.“The all-or-nothing approach when it comes to food often fails and sets dieters up for a harmful yo-yo diet cycle,” she added. Ficek also notes that you should recognize the difference between added sugar (like table sugar and concentrated sources like in fruit juice) and naturally occurring sugars (like those found in fruits, vegetables, full fat dairy, honey and unrefined carbohydrates). Ficek says: Begin your sugar “detox” by avoiding adding sugar to your drinks and meals, and curb obviously sweet foods like candy bars, pastries and sodas. Start reading labels on the items in your refrigerator and pantry. Many foods like sauces, condiments, soups and of course sodas have added sugar. It may masquerade under a different name, but rest assured that any ingredient that ends in “-ose” probably means sugar. This process will likely be quite daunting; as most packaged, canned and otherwise processed and preserved foods have added sugar. Ficek says: When your body is dehydrated it actually craves sweets, so by drinking a lot of water during the day you can decrease your sugar cravings and give your body more energy. When you are first starting out, drink at least one large glass of water each hour of the work day. Ficek says: If you know that you are addicted to sugar and experience headaches and body aches after not having sweets, it is even more important to jumpstart your health by eating real whole foods to help cleanse your body from toxins and give you more energy. Ficek says: Adding greens to your diet is one of the best ways to keep energy levels up and eliminate those sweet cravings. Try having a green smoothie for breakfast, a big salad for lunch and a green veggie stir fry for dinner. These meals will make you feel so good; you won’t dare go back to those sweet treats. Ficek says: When craving chocolate or cookies, why not try an apple instead? 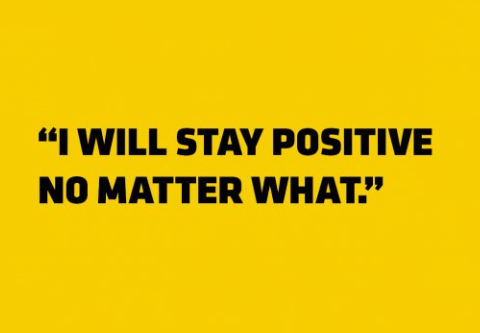 You may be surprised with how satisfied you feel after. The natural sugars and fiber in whole fruits will provide the sweetness you are craving without the blood sugar spike, keeping energy and moods lifted. This review article highlights current knowledge on the association between low back pain and smoking, with an emphasis on the role of nicotine. Interestingly, the prevalence of tobacco use is nearly 2-fold higher among patients with chronic pain.3-5 The reasons for this increased prevalence are believed to be related to many factors, encompassing both behavioral and biological mechanisms. This review will cover current knowledge on the biological mechanisms and pathophysiology behind the relationship between smoking and chronic pain. The behavioral mechanisms are discussed in a Q&A with Joseph W. Ditre, PhD. Cigarettes contain many compounds that produce physiologic effects, but this review focuses on nicotine, which is the most widely studied of these compounds and is believed to play a role in pain modulation. Nicotine has analgesic properties that, at first, can help relieve acute pain. However, over time, nicotine can alter pain processing and contribute to the development of chronic pain and greater pain intensity. This paradox is an important aspect of both acute and chronic pain management for patients who use tobacco products. A variety of factors are believed to contribute to the analgesic effects of short-term exposure to nicotine. It is important to differentiate the effects of nicotine in experimental versus epidemiologic studies. While experimental studies suggest an analgesic and antinociceptive effect of tobacco use in acute pain, epidemiologic studies point to a causal association between smoking and chronic pain. In a study involving 10,916 patients, Ekholm et al found that cigarette smoking was significantly increased in individuals suffering from chronic pain; in opioid users, smoking was further increased.5 In addition, in a well-organized survey involving 73,507 people (aged 20-59 years), Alkherayf et al found a higher prevalence of LBP in daily smokers compared with nonsmokers (23.3% vs 15.7%; P<0.0001).43 This association was statistically significant in all age groups and genders, and was strongest in younger age groups. The data suggested a positive correlation between the smoking dose and the risk for LBP. Further evidence of the link between smoking and pain chronicity is found in a study of 6,092 women over the age of 18 years reported by Mitchell et al.44 Women who smoked daily had a 2-fold higher prevalence of chronic pain compared with women who never smoked. In addition, women who were “some-day” smokers had a 1.8-fold increased prevalence of chronic pain. While the etiology of chronic pain is multifactorial, these data suggest that smoking is a risk factor for development of chronic pain. Although clinicians barely have time to finish their medical records, this should not preclude them from talking to their pain patients about smoking cessation. We must dedicate time to this task, provide our patients with educational materials, and keep the door open to bring up the subject on subsequent follow-ups. In a well-designed cohort study, Kaye et al showed that persistence on the part of the physician can significantly reduce both the amount and prevalence of nicotine consumption among pain patients in a relatively short amount of time.57 Given the impact of smoking on pain chronicity, it is imperative that physicians implement strategies to help their patients stop smoking. He would never come out and say it, but when Kristoff Kowalkowski is on the football field he is typically one of the smartest players. 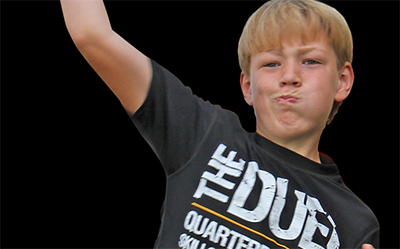 Not only is the 11-year-old Duel winner a straight-A student at Madison Elementary School in St. Cloud, Minn., Kowalkowski comes from a football family. Oh yeah, he can also speak and write Chinese thanks to participating in an immersion program at school. It’s little wonder Kowalkowski has a complete understanding of whatever offense he is running. “I like being one of the leaders on the field,” the 5-foot-3, 110-pounder said. “It’s really fun when you learn everything and then you can just see it come together on the field. And I like picking apart defenses.” While he is still developing his game, Kowalkowski has already established himself as a dangerous QB capable of shredding the opposition. Dr. Thomas Kowalkowski, Medical Director of IPPMC, Intervention Pain and Physical Medicine Clinic, recently was selected to present his research findings, at the Annual Scientific Research meeting in Orlando, Florida. His presentation title was The results of Patients treated with Percutaneous Hydrodiscectomy for Radiculopathy Secondary to Herniated Nucleus Pulposis. 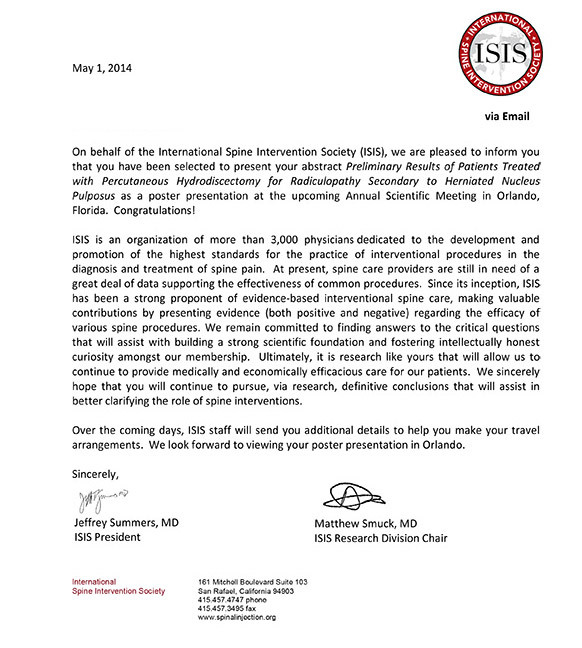 The International Spine Interventional Society (ISIS), is an organization of over 3,000 physicians dedicated to the development and promotion for the highest standards of practice of interventional procedures in the diagnosis and treatment of spine pain. 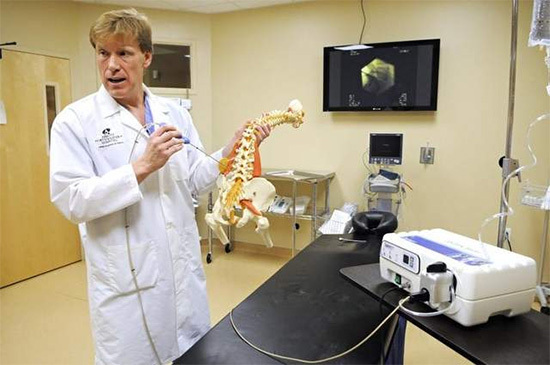 Dr. Thomas Kowalkowski, medical director of the Interventional Pain and Physical Medicine Clinic in Sartell, shows a new device called HydroCision Sept. 17. The device is a minimally invasive treatment that uses high-speed water to remove herniated disc tissue without invasive surgery. Who is a good candidate for HydroCision? Those with a bulging spinal disc that has not ruptured into the spinal canal. Someone whose pain has not improved after four or more weeks of conservative care, which typically consists of physical therapy, pain medications, and if necessary, epidural steroid injections. A person with signs of nerve damage in the leg (severe weakness, loss of coordination, loss of feeling). In most cases, you will be able to go home the same day as your procedure. Plan on bed rest with gentle stretching for several days. You may need over-the-counter or prescription pain medication for several days. What if you could “wash away” back and leg pain using a “blade” that never gets dull? With HydroCision, a jet of saline solution comes out of a nozzle that is 0.005 inches in diameter — “slightly larger than a hair” — and can cut away protruding disc tissue that can cause the back and leg pain without an actual blade. The advantages of the 20-minute outpatient procedure are: No hospitalization, quicker recovery times, less pain, no surgical trauma to the back muscles and no general anesthesia. “There is no muscle damage, no bone removal, no nerve root manipulation ... and the size of the wound is approximately 4 mm,” Kowalkowski said. Kowalkowski began offering HydroCision a few years ago to his patients; he is the medical director of the Interventional Pain and Physical Medicine Clinic in Sartell. “The procedure and the study I have completed on it was published in a pain journal this summer,” he said of the official publication of the International Association for the Study of Pain. Water-based tools previously have been used outside the medical field. “They were used in the aerospace industry and automotive industry for cutting and preparing things ... because the blade never gets dull or gunky,” Staid said. HydroCision Inc. brought its cutting device into the medical field in 2005, and disc treatment is one of the uses. When the outer wall of a spinal disc becomes damaged or weakened through age or injury, the inner part of the disc may bulge out in what is known as “disc herniation” or a “slipped” disc. The water jet comes out of a tiny tube at the end of a spark plug-like tip and is collected — along with the blasted tissue — in another tube built into the same probe, completing a circuit of sorts. “When the physician’s foot is not on the control pedal, it’s nothing but a benign metal probe,” said Staid, who came up with the concept with Tim Moutafis, a colleague. Staid is the chief technology officer and vice president of application development at HydroCision Inc., a developer and manufacturer of fluidjet-based surgical tools. Only spinal discs that have not ruptured may be treated with the water-based procedure, according to Kowalkowski. HydroCision costs about $2,000 to perform at his Sartell clinic and may be covered by insurance — compared with the estimated $15,000 it would cost for surgery, he said. “There is a week’s recovery time versus, many times, eight weeks or more with surgery,” Kowalkowski said. He also said that in the worst-case scenario that HydroCision does not work, the patient could still have surgery; HydroCision has between a 73 and 98 percent success rate. The physician uses a fluoroscope, which is a machine that projects live X-ray images onto a monitor, to place the water-dispensing probe within the disc. “The patient is not even fully anesthetized. They’re awake and alert on the table,” Staid said. The system has been used in more than 45,000 spinal, arthroscopic and wound debridement procedures, according to HydroCision Inc. Most people in the United States will experience lower back pain at least once during their lives, and more severe leg pain can affect one’s ability to walk, according to the Mayo Clinic. “At the end of the day, it was hard to even walk because I just ached so bad, and I couldn’t do the activities that I used to be able to do,” said Amy Rasmussen, a patient of Kowalkowski’s. The 36-year-old registered nurse from Zimmerman said based on her work in a health care setting, she believes not a lot of physicians are aware of HydroCision Inc.
“I work in patient care, and I was lifting a patient and that kind of ruined my back,” Rasmussen said. Her injury occurred when she was working with a 350-pound patient. She said she has experienced lower back pain, swelling, and achy hips and legs because of the injury and had a lot of frustration before she tried HydroCision in August. “I figured it was worth it to try this procedure because when you are in that much pain, you’re willing to do anything, and the minute the procedure was done, that pain was gone immediately,” she said. SARTELL — A 5,000-square-foot expansion is nearing completion at the Interventional Pain & Physical Medicine Clinic (IPPMC). 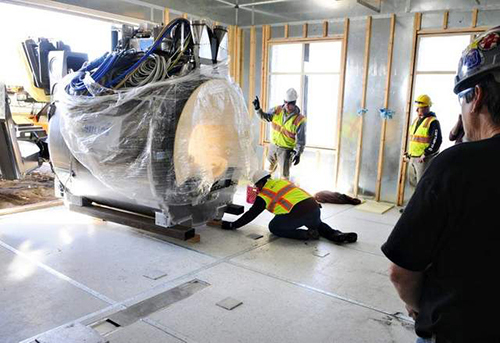 One of the latest pieces to fall in place was a new 12,000-pound MRI machine workers moved into place Monday with a forklift. 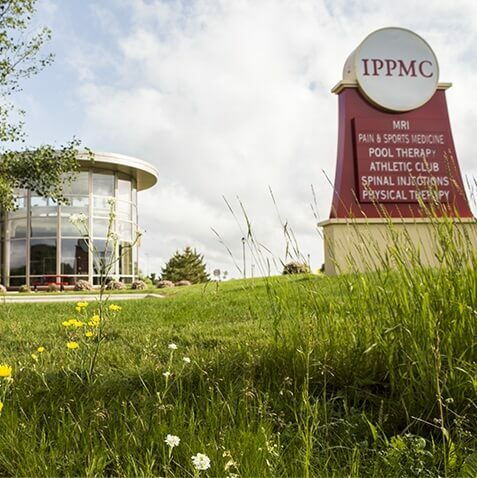 IPPMC started in 2003 in a small building on Stearns Way. Five years later, it moved to a 15,000-square-foot building at 2301 Connecticut Ave. The additional 5,000 feet was necessary to accommodate more patients and staff, according to Dr. Thomas Kowalkowski, who founded the practice. For three years, the clinic had been using an MRI machine in a semi trailer parked outside the front door. “This is a newer machine, and it’s going to be a permanent part of our facility, so we can continue to provide people the best care possible,” said Kowalkowski, who graduated from St. John’s University, the University of New England and completed a fellowship in anesthesiology and pain medicine at Oregon Health and Science University. 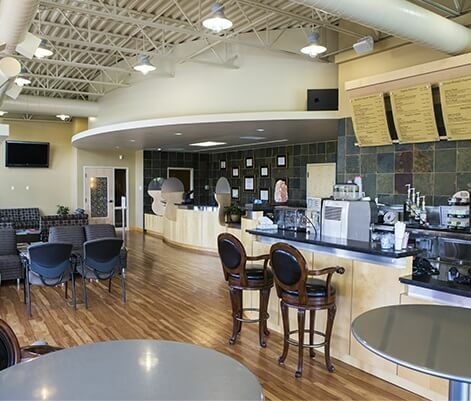 IPPMC has about 50 employees, and its building now features everything from an organic coffee and juice bar to a whirlpool, exercise pool and sauna, to a fully-stocked gym. The clinic also has openings for nine more full- and part-time positions. Earlier this month, IPPMC earned the Excellence in Pain Practice Award from the World Institute of Pain. IPPMC is one of 17 pain centers in 11 countries to receive the honor. WINSTON-SALEM, North Carolina, USA (March 11, 2013) – The World Institute of Pain (WIP) has conferred the Excellence in Pain Practice (EPP) Award for Multidisciplinary Clinical Pain Practice on the Interventional Pain and Physical Medicine Clinic (IPPMC) in Sartell, Minnesota, USA. 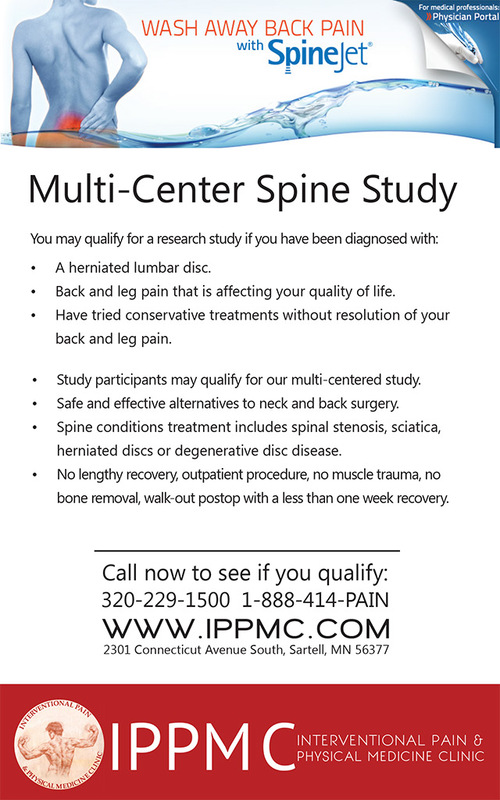 “IPPMC’s attributes include providing a multidisciplinary pain centered approach to the prevention, evaluation, treatment, and rehabilitation of painful disorders,” said Dr. Bruce Wymore, a family practitioner in Alexandria, Minnesota. The EPP Award program, established in 2010 by the World Institute of Pain, recognizes pain centers that demonstrate the highest standards of pain practice around the world. Varying levels of recognition are attainable, including specialization in a particular area of clinical pain practice, multidisciplinary clinical pain practice, and comprehensive recognition that encompasses all dimensions of pain management including cutting-edge research. EPP Awards have been conferred on 17 pain centers in 11 countries. To qualify for the award, a site visit is conducted by an FIPP (Fellow of Interventional Pain Practice) member of WIP’s inspector’s panel. The EPP Award Committee exercises its due diligence in the determination of each award given, in accordance with WIP’s guidelines for EPP Award recognition. WIP is an international, nonprofit organization founded in 1993 that brings together the most recognized experts in the field of pain medicine for the advancement and standardization of interventional pain practice. WIP achieves its purposes and objectives through organizing physician-oriented educational symposia, practical workshops, and World Congresses; certifying as Fellows of Interventional Pain Practice (FIPP) physicians who pass a competency-based, multi-part examination; publishing the scholarly journal, Pain Practice; and establishing liaisons with physicians and industry worldwide to promote the specialty of pain medicine. IPPMC Patients need NOT be concerned with the multi-state meningitis and septic arthritis outbreak. IPPMC has not utilized these pharmaceutical products. All medications at IPPMC are FDA Approved. IPPMC is dedicated to offering the highest standard of care based on patient outcomes. CDC and FDA have confirmed the presence of a fungus known as Exserohilum rostratum3in unopened medication vials of preservative-free methylprednisolone acetate (80mg/ml) from one of the three implicated lots from NECC (Lot #08102012@51, BUD 2/6/2013). The laboratory confirmation further links steroid injections from these lots from NECC to the multistate outbreak of fungal meningitis and joint infections. Testing on the other two implicated lots of methylprednisolone acetate and other NECC injectables continues. Clinicians are also requested to report any suspected adverse events following use of these products to FDA's MedWatch program at 1-800-332-1088 or www.fda.gov/medwatch4. Health care professionals and patients may dial FDA’s Drug Information Line at 855-543-DRUG (3784) and press * to get the most recent information regarding the meningitis recall and speak directly to a pharmacist. There is now available a Patient Notification Letter5 on the FDA "Update on Fungal Meningitis" webpage under the "Related Information" section. This letter template is for healthcare professionals notifying patients administered a drug produced by the New England Compounding Center (NECC) that has been recalled. Another large trial shows no benefit from ginkgo biloba extract in preventing Alzheimer disease, researchers report in the Lancet Neurology. Nearly 2900 older adults without dementia who spontaneously reported memory complaints to their physicians were randomized to consume standardized ginkgo biloba extract or placebo for 5 years. Overall, the rate of diagnosis with probable Alzheimer's did not differ significantly between the ginkgo and placebo groups (1.2 and 1.4 cases per 100 person-years). The authors note that a lower-than-expected Alzheimer's rate in both groups reduced the study's power, while a Lancet Neurology editorialist concludes: "For adults aged 70 years or older with a memory complaint who might be mildly cognitively impaired, use of [ginkgo biloba extract] does not decrease the risk of Alzheimer's disease over 5 years." Atherosclerosis – the hardening of arteries that is a primary cause of cardiovascular disease and death – has long been presumed to be the fateful consequence of complicated interactions between overabundant cholesterol and resulting inflammation in the heart and blood vessels. However, researchers at the University of California, San Diego School of Medicine, with colleagues at institutions across the country, say the relationship is not exactly what it appears, and that a precursor to cholesterol actually suppresses inflammatory response genes. This precursor molecule could provide a new target for drugs designed to treat atherosclerosis, which kills tens of thousands of Americans annually. The findings are published in the September 28, 2012 issue of Cell. But some macrophages fail to properly dispose of the excess cholesterol, allowing it to instead accumulate inside them as foamy lipid (fat) droplets, which gives the cells their particular name: macrophage foam cells. These foam macrophages produce molecules that summon other immune cells and release molecules, signaling certain genes to launch an inflammatory response. Glass said conventional wisdom has long assumed atherosclerotic lesions – clumps of fat-laden foam cells massed within arterial walls – were the unhealthy consequence of an escalating association between unregulated cholesterol accumulation and inflammation. Glass and colleagues wanted to know exactly how cholesterol accumulation led to inflammation, and why the macrophages failed to do their job. Using specialized mouse models that produced abundant macrophage foam cells, they made two unexpected discoveries that upend previous assumptions about how lesions form and how atherosclerosis might be more effectively treated. “That’s the next thing to study; why that happens,” Glass said, hypothesizing that the cause may be linked to overwhelming, pro-inflammatory signals coming from proteins called Toll-like receptors on macrophages and other cells that, like macrophages, are critical elements of the immune system. The identification of desmosterol’s ability to reduce macrophage cholesterol presents researchers and drug developers with a potential new target for reducing the risk of atherosclerosis. Glass noted that a synthetic molecule similar to desmosterol already exists, offering an immediate test-case for new studies. In addition, scientists in the 1950s developed a drug called triparanol that inhibited cholesterol production, effectively boosting desmosterol levels. The drug was sold as a heart disease medication, but later discovered to cause severe side effects, including blindness from an unusual form of cataracts. It was pulled from the market and abandoned. Co-authors are first author Nathanael J. Spann, Norihito Shibata, Donna Reichart, Jesse N. Fox and Daniel Heudobler, UCSD Department of Cellular and Molecular Medicine; Lana X. Garmire, UCSD Department of Bioengineering; Jeffrey G. McDonald and David W. Russell, Department of Molecular Genetics, UT Southwestern Medical Center; David S. Myers, Stephen B. Milne and Alex Brown, Department of Pharmacology, Vanderbilt Institute of Chemical Biology; Iftach Shaked and Klaus Ley, La Jolla Institute of Allergy and Immunology; Christian R.H. Raetz, Department of Biochemistry, Duke University School of Medicine; Elaine W. Wang, Samuel L. Kelly, M. Cameron Sullards and Alfred H. Merrill, Jr., Schools of Biology, Chemistry and Biochemistry and the Parker H. Petit Institute of Bioengineering and Bioscience, George Institute of Technology; Edward A. Dennis, UCSD Department of Chemistry and Biochemistry; Andrew C. Li, Sotirios Tsimikas and Oswald Quehenberger, UCSD Department of Medicine; Eoin Fahy, UCSD Department of Bioengineering; and Shankar Subramaniam, UCSD Departments of Cellular and Molecular Medicine, Bioengineering and Chemistry and Biochemistry. Funding for this research came, in part, from National Institutes of Health grants GM U54069338 (to the LIPID MAPS Consortium), P01 HC088093 and P01 DK074868. The U.S. Food and Drug Administration today approved a risk evaluation and mitigation strategy (REMS) for extended-release (ER) and long-acting (LA) opioids, highly potent drugs approved for moderate to severe, persistent pain that requires treatment for an extended period. Based on an FDA Blueprint, developed with input from stakeholders, educational programs for prescribers of ER/LA opioids will include information on weighing the risks and benefits of opioid therapy, choosing patients appropriately, managing and monitoring patients, and counseling patients on the safe use of these drugs. In addition, the education will include information on how to recognize evidence of, and the potential for, opioid misuse, abuse, and addiction, and general and specific drug information for ER/LA opioid analgesics. These materials contain consumer-friendly information on the safe use, storage and disposal of ER/ LA opioid analgesics. Included are instructions to consult one’s physician or other prescribing health care professional before changing doses; signs of potential overdose and emergency contact instructions; and specific advice on safe storage to prevent accidental exposure to family members and household visitors. Companies will be expected to achieve certain FDA-established goals for the percentage of prescribers of ER/ LA opioids who complete the training, as well as assess prescribers’ understanding of important risk information over time. The assessments also cover whether the REMS is adversely affecting patient access to necessary pain medications, which manufacturers must report to FDA as part of periodic required assessments. Researchers at King’s College London have for the first time identified a gene linked to age-related degeneration of the intervertebral discs in the spine, a common cause of lower back pain. Costing the UK an estimated £7billion a year due to sickness leave and treatment costs, the causes of back pain are not yet fully understood. Until now, the genetic cause of lower back pain associated with lumbar disc degeneration (LDD) was unknown, but the largest study to date, published this week in the journal Annals of Rheumatic Diseases, has revealed an association with the PARK2 gene. The researchers, funded by the Wellcome Trust and Arthritis Research UK, say more research into this surprising association needs to be carried out in order to fully understand how it is triggered, but this new finding could ultimately pave the way towards developing new treatments in the future. LDD is a common age-related trait, with over a third of middle-aged women having at least one degenerate disc in the spine. Discs become dehydrated, lose height and the vertebrae next to the discs develop bony growths called osteophytes. These changes can cause or contribute to lower back pain. LDD is inherited in between 65 – 80 per cent of people with the condition, suggesting that genes play a key role. Scientists compared MRI images of the spine in 4,600 individuals with genome-wide association data, which mapped the genes of all the volunteers. They identified that the gene PARK2 was implicated in people with degenerate discs and could affect the speed at which they deteriorate. Dr Frances Williams, Senior Lecturer from the Department of Twin Research and Genetic Epidemiology at King’s College London, said: 'Back pain can have a serious impact on people’s lives and is one of the most common causes of sickness leave, costing both the NHS and UK economy billions each year. 'We have performed, using data collected from around the world, the biggest genome-wide association analysis of lumbar disc degeneration (LDD). We know that people whose discs wear out are at increased risk of episodes of lower back pain, but normal human discs are hard to get hold of to study so until now our knowledge of normal human biology was incomplete. 'We have identified a gene called PARK2 as associated with LDD. We have shown that the gene may be switched off in people with the condition. Interventional Pain & Physical Medicine Clinic has been awarded a three-year term of accreditation in magnetic resonance imaging (MRI) as the result of a recent review by the American College of Radiology (ACR). MRI is a noninvasive medical test that utilizes magnetic fields to produce anatomical images of internal body parts to help physicians diagnose and treat medical conditions. Dr. Kowalkowski practices Interventional Pain and Sports medicine full time. He is a diplomate of the American Board of Physical Medicine and Rehabilitation from the University of Minnesota with a sub-specialty in pain medicine. He has completed an ACGME Fellowship in Anesthesiology/Pain Medicine from Oregon Health and Science University. Dr. Kowalkowski is a Fellow of Interventional Pain Practice (FIPP), the only certifying agency which tests the ability to perform interventional pain procedures. He is a member of the American Society of Anesthesiologists, The World Institute of Pain, American Society of Interventional Pain Physicians, North American Spine Society, International Spinal Injection Society, and PASSOR (Physiatrist Association of Spine, Sport, and Occupational Rehabilitation).